Harnessing Hibernate is an ideal introduction to the popular framework that lets Java developers work with information from a relational database easily and efficiently. Databases are a very different world than Java objects, and they often involve people with different skills and specializations. With Hibernate, bridging these two worlds is significantly easier, and with this book, you can get up to speed with Hibernate quickly. 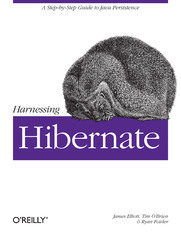 Rather than present you with another reference, Harnessing Hibernate lets you explore the system, from download and configuration through a series of projects that demonstrate how to accomplish a variety of practical goals. The new edition of this concise guide walks you through Hibernate's primary features, which include mapping from Java classes to database tables, and from Java data types to SQL data types. You will also learn about Hibernate's data query and retrieval facilities, and much more. Once you're past the first few chapters, you can jump to topics that you find particularly interesting or relevant. All background material and explanations of how Hibernate works and why is in the service of a focused task. Source code can be downloaded from the book's website. If using SQL is an uncomfortable chore, Harnessing Hibernate offers you an effective and trouble-free method for working with the information you store in your applications. What is a Data Access Object? Why would I want to use a DAO? Where are the other DAOs? How do I activate the transactional annotation?